101115 - Up and boys to school, J having trouble getting ready these days... I had a slow start but got a ton of things done. Out of the office for dinner, couple more things done and then all boys in the kitchen to make cakes. D went first and got his hand stuck in the mixer beaters... great example... But he showed the other two how it was done. D's cake in the oven, then J mixing it up. J had a very scientific method and did a fine job for his first cake. J's cake in the oven, then patient G beat it up. He did really good with help and not too many egg shells in the batter... D's cake is done, G's cake in the oven. L took over watching the cakes and J&I to the office store for scout stuff. Home, all boys to bed and then I headed out to meet with the Bible Bangers. 101114 - Up and all to church. D saw a big metal thing hanging above a car. Arby's for lunch. D&I worked on his AEP project for school. 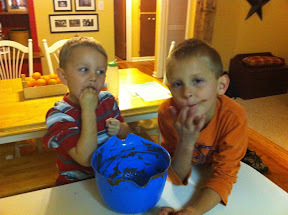 Then the boys all designed their cakes for the big cake bake this week as we watched the rest of the old 'Train' movie. Then LD&J to their Christmas practice, where L 'volunteered' to help... G&I to the grocery for cake supplies and hot chocolate and coffee. We all met home for dinner. After dinner I played rough with the boys and then all boys to bed. Now up late trying to organize new Tiger Den for Jack.